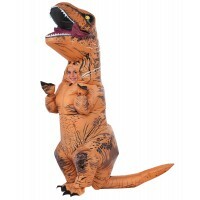 Become the most fearsome of dinosaurs in our T-Rex Inflatable Dinosaur Costume! Inflatable T-Rex dinosaur adult costume is a viral video star perfect for Halloween too. Small 36" 26 - 28" 33"
Medium 42" 30 - 34" 33"
Large 46" 36 - 40" 33"
Plus Size 50" 42 - 46" 33"
This adult dinosaur costume is an internet sensation with viral videos and television appearances world wide. Step into this adult t-rex inflatable costume and have fun or make your own video productions. This inflatable t-rex cosplay costume is great for Halloween and any event. Costume includes an action packed full-body inflatable jumpsuit, excellent orange and brown multicolor detailing, with white scratch marks to show the most gruesome of fights! Signature yellow eyes and piercing white teeth, completes the look of this carnivorous creature! Adult standard size one size fits most teens and adults up to size 44. Unisex. 100% Polyester. Care instructions: wipe clean with damp cloth, line dry, do not wash, do not bleach, do not iron and do not dry clean. This is the costume you have seen all over You-tube and on TV shows like Inside Edition and more. Limited quantities available due to it's fame. Item Number: M/RB-810481 | Approximate Size (Inches): 12.00 wide x 4.00 deep x 16.00 high | Approximate Shipping Weight: 2.00 lbs.